In addition to being a professional software engineer, I routinely create software for my own use, and offer it free to anyone that would also like to use it. Most modern software is digitally signed using a code signing certificate. This is a nice feature that allows you to easily verify the authenticity and integrity of downloaded software. However, these certificates are quite expensive, and using them for free software simply does not make sense. Thus, the software I make available through this web site is not signed with a certificate. The software is safe, but you may receive a warning about this during installation. If you find my software useful and would like to make a donation, please feel free to do so via PayPal. While certainly not a software-only solution, GlassPack provides experimental aircraft builders and owners to create their own completely customized instrumentation system using low-cost tablet computers and cell phones. 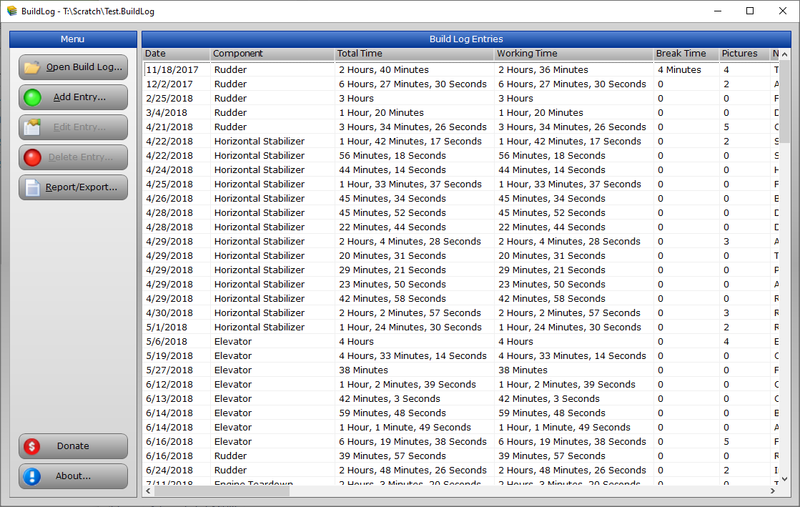 BuildLog is a simple program for keeping track of time worked while building an experimental aircraft. It allows you to easily track and organize your work by date, aircraft component, time spent, etc. 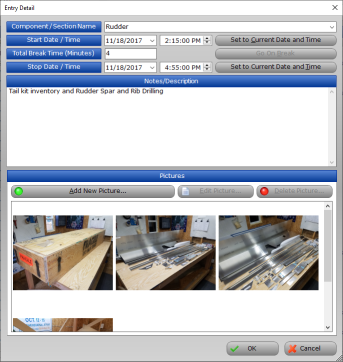 Pictures can also be added, with descriptions, and BuildLog supports exporting data to tab-separated files for use with Microsoft Excel, Google Sheets, and various other programs capable of custom reporting and printing. Windows: Click Here to download BuildLog. 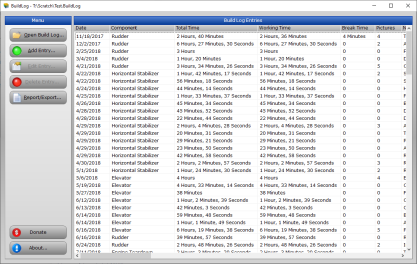 On Windows, BuildLog requires the Microsoft .NET runtime version 4.6.1 or later. You probably already have this on your computer, but if not, please download and install it from Microsoft. If you don't want to install the program using the setup tool above, you can download the Zip file linked below. Linux/Macintosh: BuildLog runs on Linux/Macintosh with Mono. Download the Zip file and unzip to any directory. On the command line in the directory where you unzipped the file, enter chmod 777 BuildLog and then./BuildLog to start the program. If there is any interest from the community on using BuildLog on Linux/Macintosh, please let me know and I will work to make this process easier. 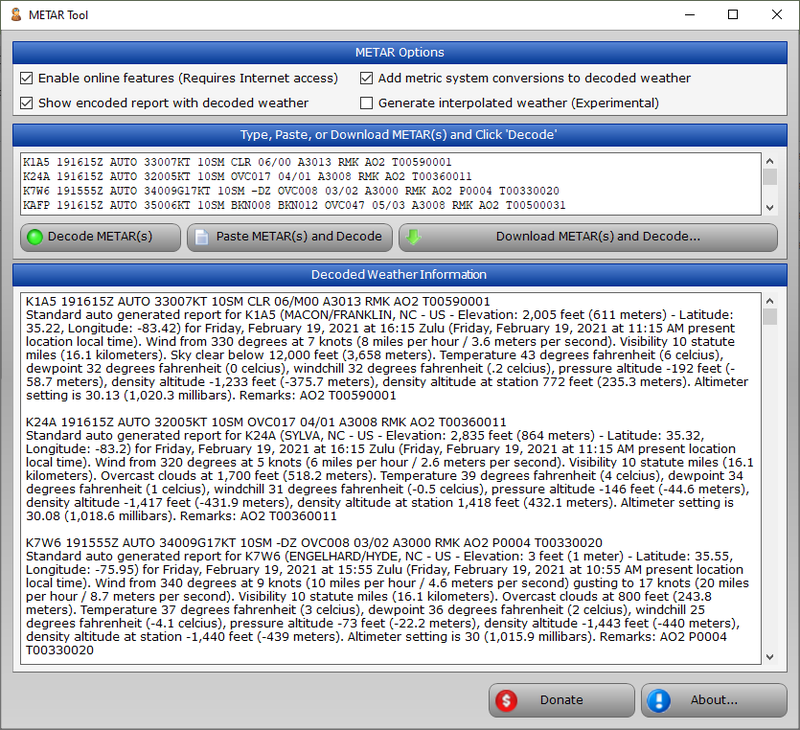 METAR Tool translates aviation weather reports into pilot friendly language. 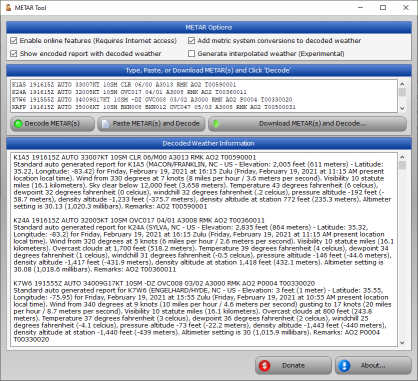 You can enter or paste METARs manually, or download them using the IDs of weather reporting stations. The software can also download weather reports for an entire state, or from stations along a flight path. Output can be customized with optional metric system conversions, and can even generate interpolated (averaged) weather reports. Windows: Click Here to download METAR Tool. On Windows, METAR Tool requires the Microsoft .NET runtime version 4.6.1 or later. You probably already have this on your computer, but if not, please download and install it from Microsoft. If you don't want to install the program using the setup tool above, you can download the Zip file linked below. Linux/Macintosh: As of version 1.1, METAR Tool runs on Linux/Macintosh with Mono as well. Download the Zip file and unzip to any directory. On the command line in the directory where you unzipped the file, enter chmod 777 MetarTool and then./MetarTool to start the program. If there is any interest from the community on using METAR Tool on Linux/Macintosh, please let me know and I will work to make this process easier. Web Only: I have created a simplified web version you can use online if you prefer not to install the software on your system.